Week 2 showed why you shouldn’t jump to conclusions after one week of football. Five teams won by 15 points or more in Week 1, and on Sunday, four of them — the Vikings, Lions, Seahawks, and Titans — lost their second game by an average of more than 16 points. (The fifth, Philadelphia, plays tonight at Indianapolis.) Austin Davis, Drew Stanton, and Kirk Cousins each won games as their team’s primary passer. Two of the top six scoring running backs in fantasy football were Knile Davis and Bobby Rainey. Whatever that was in San Francisco last night happened. And I’ll have to check my records, but I’m pretty sure every single player on every single fantasy football team in America got injured. The bigger story probably belongs to the surprises at the top and bottom of the league standings. Let’s take a look at two of those teams and see what chance they have of continuing on their respective paths. What’s Gone Wrong With the Saints? Losing to the Falcons in Atlanta during Week 1 didn’t knock too many people off the Saints bandwagon. Sure, the defense looked bad, but it was a tough matchup against one of the best passing offenses in football! A few schematic shifts, a better day from the pass rush, and those problems would all be solved. Besides, even if the defense stays terrible, who wants to bet against Drew Brees in a shootout? The Browns, though? If you imagined in July what a 26-24 victory over New Orleans would have looked like, you might have figured in some unholy game from an uncoverable Josh Gordon and a few big plays from a scrambling Johnny Manziel to set up a late field goal. Not exactly. Manziel took his first snaps as a pro, but he mostly handed off before throwing a lone incomplete pass. Gordon’s suspension reportedly was shortened, but he’ll still likely be out until November 23 at the earliest. Tight end Jordan Cameron and halfback Ben Tate were also missing for the Browns, who started Brian Hoyer, Andrew Hawkins, Miles Austin, Jim Dray, and rookie third-rounder Terrance West at the skill-position spots. And won. Naturally, the first thing you’re inclined to point at when breaking down the problems in New Orleans is Rob Ryan’s defense. Expected to be among the best units in football after adding Pro Bowl safety Jairus Byrd this offseason, the Saints have instead allowed 63 points through their first two games, more than anybody else in football besides the Jaguars (75). And that’s with Byrd stripping Julio Jones as he was about to run into the end zone on a long catch-and-run last week. Six of those points are from the Tashaun Gipson pick-six that Brees served up this week, but you get the idea: Ryan’s defense is a mess. The biggest problem? Patrick Robinson. I wrote about Robinson’s struggles against the Falcons last week, and as you might have expected, the Browns watched that tape and adjusted their offense accordingly. They were happy to target Robinson, who was a disaster for much of Sunday’s game. He committed a 19-yard pass interference penalty on third down that gave the Browns a first down in the red zone, leading to a touchdown. A neutral zone infraction by Robinson at the end of the first quarter wiped a 44-yard missed field goal by Billy Cundiff off the board and gave Cleveland a first down, which eventually turned into a successful Cundiff field goal. Robinson was benched at that point for Corey White before returning as the slot corner. He later allowed a 13-yard completion to Miles Austin on the final drive before committing a holding penalty (which was declined) as part of mass miscommunication on Cleveland’s final play from scrimmage. Fans could be found after the game petitioning for Robinson’s release from the team. It’s a tough spot for Robinson, who is one year removed from tearing his patellar tendon, but the Saints aren’t overflowing with options. They cut Champ Bailey in August and gave Robinson the starting job. White was almost as bad last week and second-rounder Stanley Jean-Baptiste has been a healthy scratch each of the first two games. The Saints made a conscious choice to skimp at Robinson’s spot knowing they could very well be starting three Pro Bowl–caliber players elsewhere in the secondary with Byrd,1 Kenny Vaccaro, and Keenan Lewis. The best way to help Robinson will be to limit the amount of time he has to spend in coverage by getting pressure on opposing quarterbacks. For the second week in a row, though, the Saints’ pass rush was virtually nonexistent. Hoyer was sacked just once in his 41 drop–backs, bringing the Saints to a grand total of two sacks on 87 drop-backs this season. That’s a sack rate of 2.3 percent; last year, the Saints notched a rate of 8.5 percent. Byrd was supposed to give the Saints a safety valve and free Ryan up to be more aggressive on play calling to rush the quarterback; instead, the defense looks lethargic and erratic trying to get to the opposing passer. Cameron Jordan is still waiting on his first sack, while Junior Galette got his first on Sunday. Who could have seen that coming? It was hardly surprising that Ryan and Sean Payton were seen arguing on the sideline during the fourth quarter of Sunday’s loss; what’s the point of having a member of the Ryan family around if he’s not going to get after the quarterback? The Saints won’t be that bad all season, and they did knock Hoyer down six times, which is promising, but the pass rush is nowhere near expectations. Even if it gets better, it’s still a long, long way from good. The offense is not without blame, either. Brees was middling on Sunday, going 27-of-40 for 237 yards, with a good chunk of that going to Jimmy Graham. On passes to teammates who didn’t play basketball at Miami, Brees was 17-of-27 for 119 yards. Graham was great (10 catches on 13 targets for 118 yards and two scores), but the Saints just aren’t getting much out of anybody else besides Brandin Cooks. That’s been most noticeable in the deep passing game, where the Saints have perennially had a guy like Devery Henderson, Robert Meachem, or Kenny Stills to hit on a bomb when teams focused too much on the likes of Graham and Marques Colston. Stills isn’t 100 percent, and while Meachem is on the roster, he has caught only three passes for 37 yards this season. Brees’s longest pass in Week 1 went for 57 yards, but that was a dig route with plenty of YAC from Colston. His longest pass play against the Browns, who feature longtime Brees target Donte Whitner at safety, was only a 23-yarder to Graham. Whether it comes from Cooks in the slot or Stills out wide, the Saints desperately need to strike fear into opposing safeties with a long touchdown soon. Mark Ingram and New Orleans’s successful rushing attack should only make it easier to free up space downfield. The Saints have been excellent running the ball through two games, with Ingram spearheading a unit that has run for 313 yards on 55 carries (5.7 yards per attempt). New Orleans actually averaged more yards per play on the ground (6.4) than in the air (5.9) this week, just the fifth time that’s happened in the Brees-Payton era. You could also argue that Payton’s conservative play calling might have cost his team the game. The Saints passed up a fourth-and-1 on their own 44-yard line in the second quarter to punt. Later, on a fourth-and-2 from the Cleveland 9-yard line, Brees went out there to try to draw the Browns offside, just as he successfully did in the fourth quarter in a key moment against the Bengals several years ago. This time, the Browns didn’t jump, and in lieu of running a play, Brees called timeout and the Saints settled for a field goal.2 The Browns, meanwhile, converted a fourth-and-1 in the red zone before scoring a touchdown on the next play. Turnovers have also hurt the Saints. Sure, turnovers hurt everyone, but the Saints’ giveaways have come in crucial, game-altering moments. Well, not Khiry Robinson’s fumble on the endless laterals attempt to end the game. But the other three? Bad. Brees threw an interception in the end zone in Week 1 and followed it with a pick-six to Gipson this week. Colston’s fumble on the opening possession of overtime last week, meanwhile, turned the ball over to Atlanta in position for a game-winning field goal and swung New Orleans’s win expectancy from 53 percent to 23 percent. And that doesn’t even include the late-game sack Brees took on third-and-5 from Cleveland’s 31-yard line that turned a likely field goal opportunity into a punt.3 There will always be turnovers. But the turnovers won’t always hurt this much. The Saints are far from doomed. They’re arguably two plays away from being 2-0. The pass rush will come around. They’ll start firing on big plays. They still haven’t played at home, where they’ve averaged four more points per game with Brees than they have on the road. They get to face the Vikings and Buccaneers at home and the Cowboys on the road before their Week 6 bye, games in which they will be favored. But those dreams of a team that was going to combine a top-three offense with a top-10 defense? It’s fair to take those off the table until Ryan’s crew begins to exhibit that sort of promise. What’s Gone Right With the Bills? Amid what might have been the worst week in NFL history, the one fan base that actually had something to cheer about heading into Sunday was in Buffalo. The Bills were coming off an upset win in Chicago to start the year before being purchased on Tuesday by natural gas magnate Terry Pegula, who pledged to keep the Bills in town for the long haul. The crowd would salute the franchise’s former owner, the late Ralph Wilson, before kickoff in a ceremony led by Jim Kelly, who has beaten cancer over the past several months. Perhaps buoyed by the purchase,4 a raucous Bills crowd saw their team deliver an impressive performance during the home opener as they stomped the Dolphins, 29-10. When the dust settled at the end of the day, they had claimed sole ownership of the AFC East for just the third time in the past decade. It’s a great story, but can the Bills keep it up? It’s been only a couple of weeks since the team was in a state of upheaval. A poor preseason from second-year quarterback EJ Manuel had led Buffalo to sign veteran Kyle Orton to a lucrative two-year deal that will pay him somewhere in the $11 million range. The signing was seen by some (including myself) as a prelude to moving on from Manuel. Even though he had struggled with knee injuries during an abbreviated rookie season, Manuel had shown so little during his first 18 months with the team as to paint himself into the bust corner. With new ownership about to arrive, the front office was hoping to bring in a quarterback who could save their jobs, even if head coach Doug Marrone reportedly wasn’t very happy with the move. Even if Manuel’s days weren’t numbered, his leash seemed rather short. Two weeks later, it’s like Orton never got the call. Manuel has led the Bills to two consecutive wins, and his numbers look fine: He’s gone 32-of-48 (66.7 percent) for 375 yards (7.8 yards per attempt) and two touchdowns against one pick. He’s run for a third touchdown and hasn’t fumbled. Crucially, though, Manuel has been sacked just once on his 53 drop-backs. Last year, he was taken down on 7.8 percent of his drop-backs, one of the highest rates in football. Manuel went down once in Week 1, but the real test was going to come Sunday, when the Bills went up against a Dolphins pass rush that ate up the Patriots in Week 1. The Bills came through with flying colors, as the Dolphins didn’t sack Manuel and knocked him down just two times on pass plays. The biggest success story for that line is rookie right tackle Seantrel Henderson, a seventh-round pick who beat out fellow rookie Cyrus Kouandjio, the team’s second-round pick, for the starting gig. Henderson fell rapidly during draft week after failing a drug test at the combine and leaving the University of Miami’s pro day, but he impressed the Bills at left tackle during the preseason and he’s been a revelation through two games. Henderson naturally got help at times, but he was good enough to nearly keep Cameron Wake off the scoresheet altogether, as Wake had one assist on a tackle, no quarterback hits, and no sacks. If Henderson keeps this up, he’ll be a huge bargain for the Bills and a solid half of one of the league’s more underrated combinations with left tackle Cordy Glenn. It has helped that the Bills haven’t been in situations in which they’ve needed to throw to catch up. Buffalo has trailed for only 283 seconds this season, and that has allowed it to rely heavily on the running game.5 They were wildly successful on the ground against Chicago’s porous run defense in Week 1, and while they averaged just 3.4 yards per carry on 33 attempts against the Dolphins on Sunday, they were able to squeeze out a 47-yard run from C.J. Spiller, which set up a touchdown pass to rookie Sammy Watkins, who had his first big game as a pro. The Bills used Watkins all around the formation, but he had his most success on drag routes, running across the formation to catch the ball in stride before turning upfield. He finished with eight catches for 117 yards and a score. Spiller’s biggest contribution, meanwhile, came when he returned a Dolphins kickoff 102 yards for a touchdown in the third quarter. Buffalo’s special teams, good for years under then-coach Bobby April, have been phenomenal through two weeks. 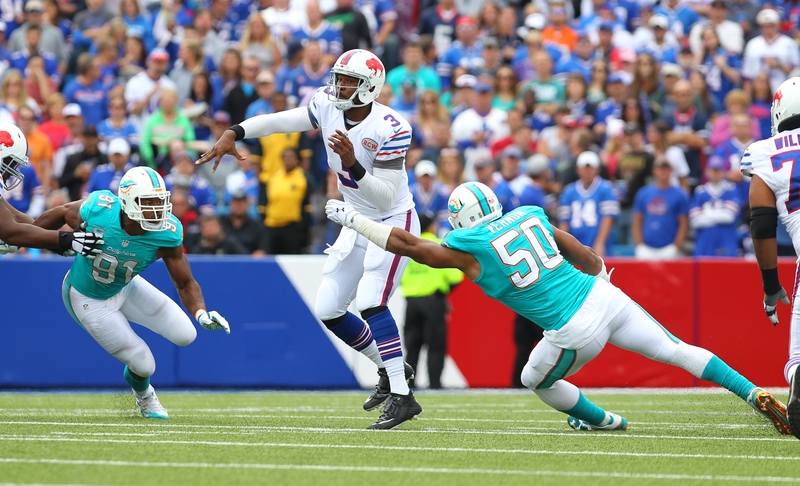 In addition to Spiller’s touchdown, the Bills blocked a punt on Sunday to set up a Dan Carpenter field goal. Carpenter, who hit five field goals Sunday, is 8-for-9 to start the year. Punter Colton Schmidt has dropped seven of his first nine punts inside the 20-yard line, and that has helped Buffalo to an enormous field-position advantage: Its average starting field position was plus-14 yards in Week 16 and plus-22 yards in Week 2, with Buffalo’s average drive starting on its own 43-yard line. The defense hasn’t missed a beat after losing Byrd, defensive coordinator Mike Pettine, and injured linebacker Kiko Alonso. An aggressive Buffalo defense has knocked away 15 passes during the first two weeks, led by the perpetually underrated Corey Graham, who helped Baltimore to the Super Bowl two years ago. The 29-year-old UNH product has knocked down six passes by himself. Also, Buffalo has been incredible on third and fourth downs, allowing opposing teams to convert just 34.4 percent of the time. Even if that number rises, the Bills are playing inspired defense under new defensive coordinator Jim Schwartz. This isn’t the first time the Bills have raised hopes after a positive start. In 2008, Buffalo started the season 4-0 — beating four teams that would finish with a combined record of 16-48 (.250) — before crashing to a 7-9 finish. Three years later, the Bills would ride Ryan Fitzpatrick to 3-0; that was likely more impressive, thanks to a blowout 41-7 win over the Chiefs and a memorable 34-31 victory over the Patriots. Buffalo would go to 4-1 with a win over the “Dream Team” Eagles and to 5-2 by shutting out Washington’s John Beck in Toronto, but injuries to Fitzpatrick slowed the offense down, and Buffalo could muster only a 6-10 campaign. You would hope the Bills could stick the landing this time around. They’ll need to follow this present script, which includes keeping games close so Manuel isn’t forcing passes in an attempt to catch up. After the two-win start to the season, Buffalo’s schedule is about to get a lot tougher. It hosts the Chargers next week before traveling to Houston and Detroit and hosting the Patriots in Week 6. If the Bills make it through that stretch at 5-1 or even 6-0, we’ll know they’re for real. It has felt for weeks, right or wrong, like a quarterback controversy was coming in Washington. On Sunday, that controversy disappeared for all the wrong reasons. A scrambling Robert Griffin suffered a noncontact injury, dislocating his ankle while rolling out to the sideline. The injury led Washington to bring in backup Kirk Cousins, who had an impressive day in leading Washington to a 41-10 victory over a hapless Jaguars team. First, Griffin. It was obviously sad to see the face of the Washington franchise facedown in pain on the sideline for minutes on Sunday, especially after having battled through a serious knee injury and a year of limited motion on said knee. Washington sources suggested Sunday night that Griffin could be back in four to five weeks, but that seems unlikely. Every other example of a dislocated ankle I can find resulted in a season-ending injury. In many cases, the injury occurred to a bigger, slower player who had his ankle rolled up in a crowd, resulting in a dislocated ankle and other damage. That includes guys like J.D. Walton, Eric Foster, and Connor Barwin. A noncontact dislocated ankle might be unprecedented. It might insinuate that there’s less damage and that the return timetable might be quicker, but we’ll know more after today’s MRI. In the bigger picture, this is probably going to be the injury that ends Griffin’s career as a franchise quarterback upon whom a team would depend as a long-term solution. His skills are still there in one way or another, but after an ACL tear in college, assorted injuries including a second ACL tear in his first two pro seasons, and this ankle injury without contact, it would be very tough for a GM to build around Griffin the same way that, say, the Colts are building around Andrew Luck. Griffin will still have a career, but if this is a season-ending injury, he veers away from the Luck career path and more toward that of somebody like Randall Cunningham or Trent Green as the above-average talent who has a few impressive post-hype seasons in between injuries. Against bad competition and with first-team practice reps, Cousins somehow played worse. His turnover rate thankfully improved, but it was still far worse than Griffin’s rate in the same offense; even if you include only Griffin’s numbers from his supposedly disastrous 2013 campaign, he turned the ball over once every 25.2 touches. Of the 47 quarterbacks who threw 200 passes or more in the regular season and playoffs between 2012 and 2013, Cousins was 43rd in completion percentage and yards per attempt, 44th in passer rating, and 46th in interception rate. His rate numbers are an almost exact duplicate for Mark Sanchez’s final season as the starter in New York, when he completed 54.3 percent of his passes and averaged 6.4 yards per attempt. Cousins turns the ball over more frequently than Sanchez did that final year, and he didn’t even get attacked by any offensive linemen. While 213 passes isn’t an enormous sample, of course, plenty of other quarterbacks have been written off in far smaller doses. Cousins was very good Sunday, but it was against a terrible Jacksonville pass defense that left the likes of Niles Paul and Andre Roberts wide open. I lost count of how many times I saw Cousins complete a pass to a receiver who had nobody within three yards. If he gets to play the Jaguars every week, Cousins will be a star. 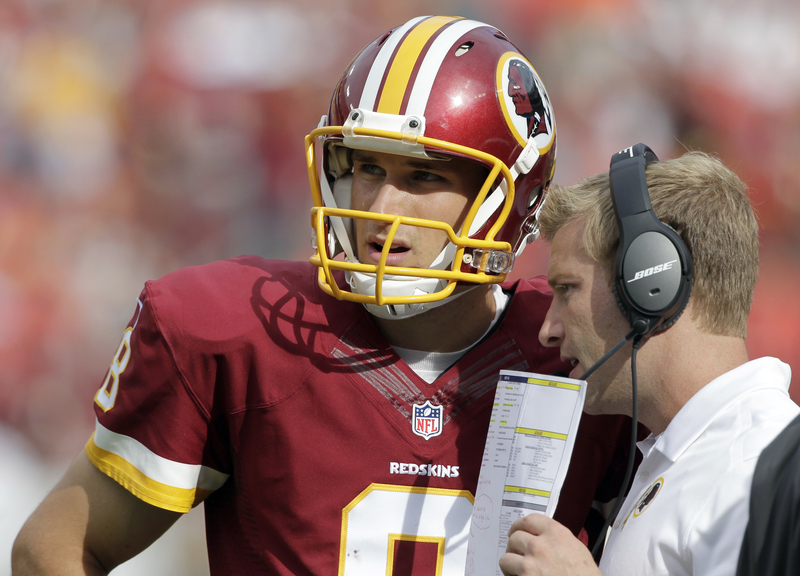 Perhaps Gruden has suddenly turned Cousins into a self-aware, accurate passer. Given that I saw dropped Cousins interceptions during the preseason and on Sunday, though, I’m skeptical. That Jaguars team, to wrap up, is unquestionably the worst team in football through two weeks. Their 17-0 lead against the Eagles was a stunning fluke, a product of Nick Foles missing open receivers running free on virtually every play during a disastrous first half. When Foles played competently during the second half, the Eagles scored 34 unanswered points. The Jaguars couldn’t get near Cousins’s receivers on Sunday, either. The defense might not even be the worst part of the team. It signed Chad Henne to a two-year, $8 million contract to be a competent game manager who understands down and distance, but Henne took sacks and threw no-chance checkdowns on third downs for most of the first half. Toby Gerhart got a three-year, $10.5 million deal to be the team’s featured back, and he finished with seven carries for eight yards. Jacksonville’s first 12 plays from scrimmage produced one net yard amid four three-and-outs. Henne was sacked 10 times on just 40 drop-backs. Ten times! When Henne finally made a play, it was an underthrown pass to the outside that unseen Washington safety Bacarri Rambo should have intercepted, only for the hapless Rambo to misjudge the pass, with Marcedes Lewis running 63 yards for an unlikely touchdown. Henne would later try the same throw to the other side of the field and get intercepted. Even worse, there’s a depressing lack of logic to what Jacksonville is doing. Coach Gus Bradley is highly regarded leaguewide for his positivity and teaching ability within an exceedingly tough rebuilding project, but his decision-making left a lot to be desired. 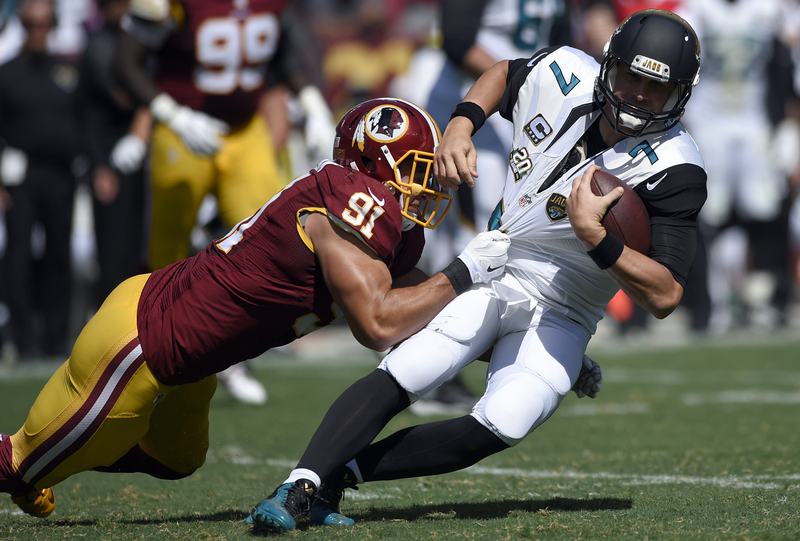 With Washington scrambling to get the ball snapped after an ill-advised sack on third down put the ball on the Jacksonville 38-yard line with no timeouts at the end of the first half, the Jaguars gifted Washington a free play by calling an inexplicable timeout with three seconds left. Washington probably should have tried a 56-yard field goal, but instead dialed up a Hail Mary that was knocked down. Midway through the fourth quarter, with Jacksonville down 34-7 and facing fourth-and-12 from the Washington 17-yard line, Bradley trotted out highly paid kicker Josh Scobee to kick a 36-yard field goal. Maybe you want to reward your offense for a long drive with points, knowing that the game’s out of reach, even if you obviously need as many points as possible if you’re really trying to win. That’s fine. On the next drive, though, the Jaguars trailed 41-10 and decided to go for it on fourth-and-16 from their own 21-yard line with 28 seconds left. Why give up earlier and go for it in a genuinely hopeless situation later? Even worse, Henne managed the situation by throwing a short checkdown to promising young receiver Allen Hurns, who was hit after a three-yard gain and suffered a sprained ankle in the process. It’s only two games, and there’s the promise of an exciting young player on the bench in Blake Bortles. So far, Jacksonville appears to be right about one thing: The best place for Bortles might be on the bench. Side note: The Saints put Byrd back to field two punts on Sunday, both of which resulted in a fair catch. Didn’t we just get past the Earl Thomas–returning-punts thing and make it clear how having your star safety risk getting hurt is a terrible idea? It’s not even like the Saints lack a viable return man; they have Brandin Cooks! Byrd, to Pro-Football-Reference.com’s knowledge (and therefore my knowledge), had never attempted to return a punt before Sunday. It would be best if it stayed that way. Imagine how bad this secondary would be without Byrd! I don’t like to tussle with Brees, but the timeout was probably more valuable than the difference between a 27-yard field goal and a 32-yard field goal. I’m positive it’s worth more than the way Brees used his first timeout — to avoid a delay of game on second-and-17 from his own 1-yard line. With 26 minutes to go before halftime, the timeout would have been much more valuable than the half-yard of space Brees saved. As you might suspect, I’m a little skeptical of the causation there. Bills fans get plenty loud when Buffalo plays well even without a change in ownership. The Bills have executed 66 running plays against just 49 passing plays. Meaning that its average starting field position was 14 yards better than that of its opposition. In this case, Buffalo started its average possession on the 33-yard line, while Chicago’s average drive started on the 19-yard line. Jackson would later leave with a sprained AC joint, an injury that leaves him day-to-day.